My first ever Toddler Primark Haul… excitingggg – check out the Haul video here! 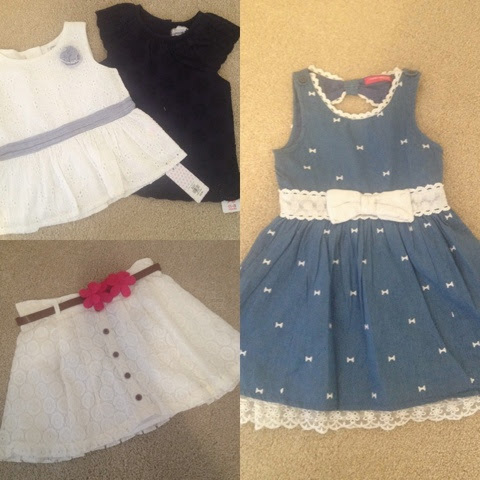 So I went shopping for a few bits for Mini Meldrum’s holiday wardrobe – She already has a few skirts & tops and I just thought I would bulk up what she has with a few cute but cheap pieces from Primark. Everything I’ve bought seems to be navy & white- lacey & frilly! But it is all suppeerrrrr cute so I don’t even care! We are off on Holiday in May to Greece and we are going with the usual company we go with Neilson! For those of you that have never been on a Neilson holiday.. ohh myy gosshhh – they are THE best! Seriously you would think I work for them the amount I bang on about how great they are. I started going on them as a child with my own parents & loved them and now go with my family & sometimes my parents join us. They are active holidays but your seriously don’t have to be totally active all the time – their tag line is ‘Relax as hard as you like!’ and you really can do every activity under the sun ‘literally’ or just chill and dabble in a few fitness classes. I’m somewhere in the middle and do fitness classes such as yoga, pilates, fitball, aqua aerobics & zuma, I also do tennis lessons which is a tennis lesson a day for two weeks and then at the end of each week there is a mini tennis tournament. The kids club is top notch and normally I would have qualms about sending mini Meldrum off to be with people I don’t know but this will be her third year of going into the kids club and she just loves it. Last year Mini Meldrum went sailing, on a speed boat, played tennis, put on a wee presentation, went kayaking & generally had a ball! This was all before her 2nd birthday… I don’t know many 2 years olds that can say they did all of that on their summer holiday!